Pros and Cons of a Traditional Printed Church Member Directory vs. an Online Church Directory. 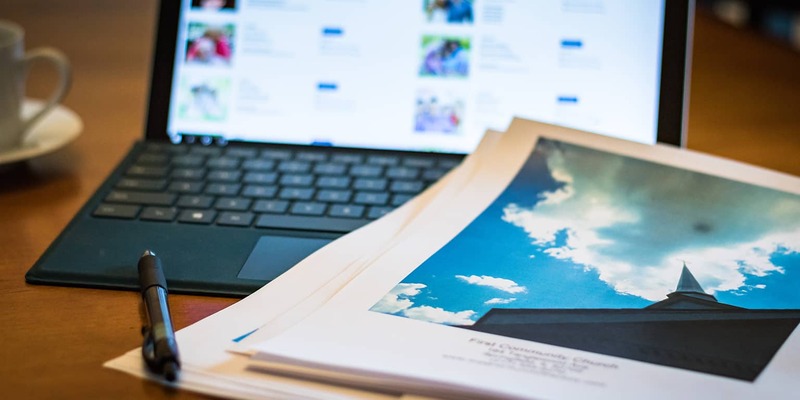 When creating your next Church Photo Directory, one question you may have is should your church continue with a Traditional Printed Photo Directory or make the switch to an Online Church Directory Program? Here are some basic Pros and Cons of each to help you decide which is right for you and your church. Your Printed Directory becomes a great keepsake, as well as a reference tool. There is something special about holding a printed directory in your hands. The excitement and buzz throughout the church when the photo directories are in, as each member begins to carefully turn through the pages taking in the entire church family is hard to replace. Older generations hold these directories close. They are pulled out over and over again to discover a member’s name or to show to visitors when a church member has done something they’re proud of. You might be surprised to see this as a pro, but when you bring in the professionals, you know it’s sure to be a great looking directory. They have all the equipment to be sure your photos look great and unified, something that is hard to do on your own. With over 60 years of experience, they can create your directory with limited volunteer support. But they also come with some headaches of their own (see cons below). More than just a Roster. Printed photo directories become more than just a contact book. They become a great way to showcase your church community through photos of trips, Family nights, Easter Egg Hunts, Missionary families, and more! Much like a school yearbook, these Photo Directories share not just families – they share a whole community. You can also sell advertising or sponsor spaces within your printed directory to recoup some of the cost of the directory itself. As soon as you finally receive your directory from a company or print one yourself, it seems to be immediately outdated. John Smith changed his cell phone and the Jones family moved to a new house. With a printed photo directory, you must either print addendums to update members or just wait until next year when it’s time to update your photo directory again. Pushy Photo Salesmen with Photo Directory Companies. If you choose to use a Photo Directory Company to help create your directory, they make the most money when your church members purchase their photo sets. This results in uncomfortable, high-pressure sales pitches that often guilt members into purchasing photos they may not want (or can afford). Families often try to avoid getting their picture taken altogether just so they don’t have to deal with the salesman. Printing can be Pricey (and Time Consuming). Printing several copies of a printed directory – whether you’re printing them yourself or using a reputable printer – can get pricey, especially for large directories. It’s hard to sort through the many online printing companies, local printing companies, and their complicated printing structures to feel good about getting the best quality printing for the lowest price. If you choose to print the directory yourself in the church office, we all know the struggles of the paper jams, out of ink warnings and the time it takes to get everything printed, sorted and put together. When using an Online Directory, as soon as you make the update in the directory, it’s updated everywhere. You don’t have to create addendums or deal with your church directory being constantly outdated. Members can trust when they access your Church Directory information they are receiving the latest and most up to date information available. On your member’s mobile devices. An online directory is accessible anywhere, at any time. So even when church members are on the go, they can access the information via their mobile phones, tablets or laptop computers. Click to call, text or email is a feature many members desperately want. They expect to be able to reach out to another member in just a few clicks. With an Online Directory, you are in the driver’s seat. You choose the photos and information, as well as when to grant or remove access to the directory. This gives you more flexibility to make the directory personalized for your church based on your church’s needs. Since the data is online, you won’t have to recollect and re-enter members information year after year. Online technology can be frustrating for some members. To provide a Safe and Secure Online Directory experience, it is highly recommended to password protect your directory. This can lead to phone calls or emails from people who forget their password or are unable to get into the directory. Just be prepared to have a little patience with members during the learning curve of using an Online Directory Program or Directory App on their mobile device. Unlike a printed directory company, there are typically yearly fees associated with an online company hosting your information. Some can get pricey very quickly, especially if they charge you per church family. The best directory programs are those with one-rate pricing. Usually, paying for the year in advance will also save you some money, just be sure you’re still able to cancel at any time to receive a refund if your church discontinues the service. Even though creating the directory may be simple, getting volunteers to take member’s photos or getting photos sent to you can be challenging. Unless you are fortunate enough to have a photographer within your church community willing to take all the photos, sometimes the quality can be less than ideal. Look for online directory programs that allow members to upload their own photos. This helps save you the time and effort of collecting them yourself. Give your members both a Printed and Online Directory Option. Of course, it’s always best when you can provide both options to your members for viewing your church directory. Instant Church Directory allows you to do just that. Why not start your 30-Day FREE trial TODAY? You’ll have 30 Days Absolutely Free to test out both the Online and Printed Directory. It’s so easy, you can create a sample directory in minutes that you can even present to your church or committee tomorrow!